Long gone are the days of simply hanging some tinsel or wearing a Santa hat! 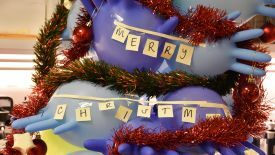 This year science Christmas decorations around the MRC WIMM were turned up a notch, with homemade bunting, life-size snowmen and so many glove Christmas trees there were rumours of plagiarism! 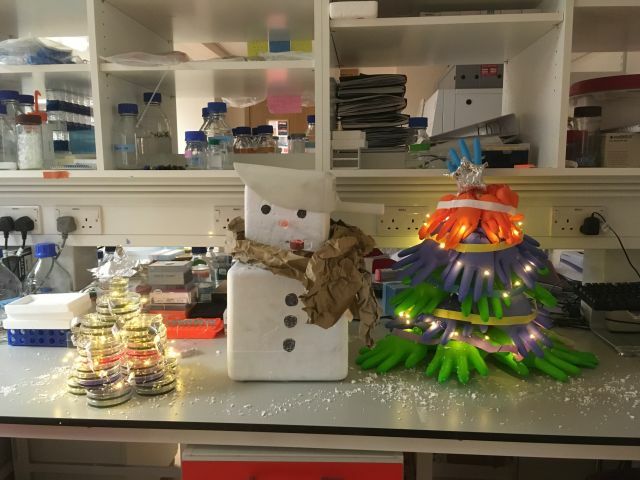 Each lab group ‘unwrapped’ their creative side and decorated the MRC WIMM for the Christmas season. 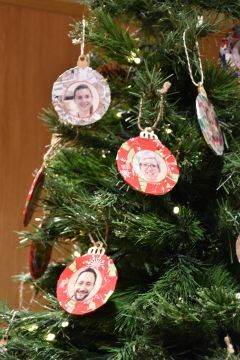 Up on the first floor, the administration office stuck their whole floor’s happy faces on baubles and of course the MRC WIMM Director, Prof Doug Higgs, was the angel of their tree. 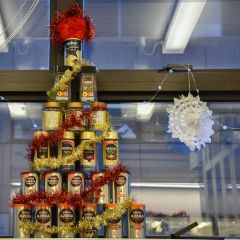 While over at the Drakesmith group, there must have been many early mornings to get their latest paper out because they made a ‘Coffemas Tree’ of recycled coffee jars. At least we all know what we need to get them for secret Santa now! 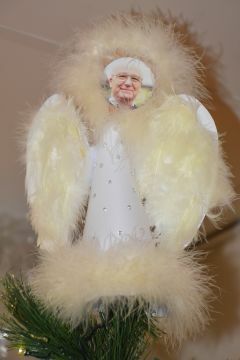 They also gave Charles Darwin a festive makeover. A well-deserved first prize went to the RehWINkel group for their creativity and abundance. 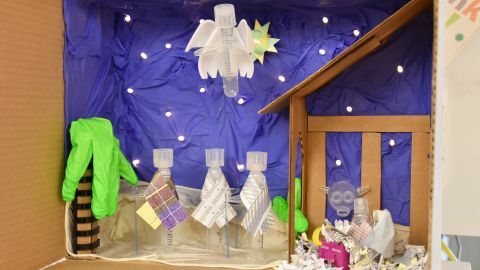 Their starry ‘Labtivity’ scene depicts the three wise men visiting a baby Jesus swaddled in aluminium foil. 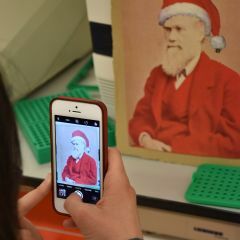 Larry the Luminometer was dressed as Rudolph with his fluorescent nose shining bright. However, the pièce de résistance was their stained glass windows. One panel featured an icosahedral virus (many of the virus models the lab studies have this capsule shape). The second panel was of the protein cGAS binding to its DNA target. Cyclic GMP-AMP synthase (cGAS) is a cytosolic DNA sensor. In the host cell, cGAS binds to DNA and catalyses the synthesis of cGAMP, a second messenger molecule that signals a cascade of events that ultimately triggers an innate immunity response. The Rehwinkel lab has shown a viral Trojan horse mechanism whereby cGAMP can be passed from cell to cell with the virus. 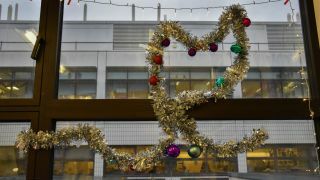 This is an amazing example of how innate immunity can be passed from cell to cell and of course, how scientific results can make for beautiful Christmas decorations. 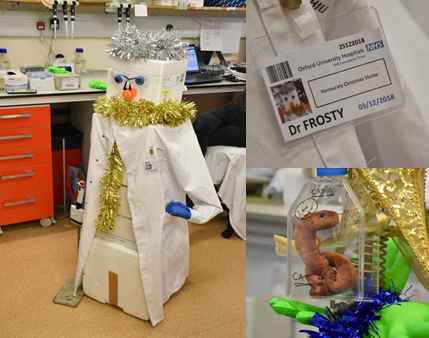 The Townsend group won second place with Dr. Frosty and their infection-themed tree, complete with identification badge and a CAT4 case for their cuddly Ebola – reminding us all that even in the buzz of Christmas it’s important to be safe! The Townsend group works on Influenza and Ebola viruses, in the search for therapeutic antibody targets. Great science is achieved when people collaborate; the Townsend lab stated they used the same attitude, with everyone contributing their ideas, creating a prize winning formula. Honourable mentions went to the Beeson and Higgs groups. 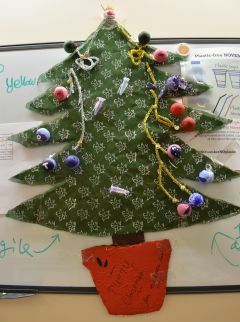 The scientific accuracy of the Higgs group’s haemoglobin tinsel is what caught the judge’s attention. Both the linear and folded forms of the haemoglobin gene were shown including promoter and enhancer binding. 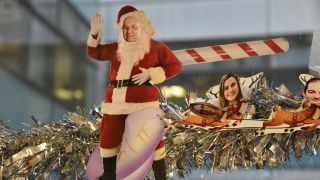 A festive addition was Prof Doug Higgs riding a polymerase II sleigh. 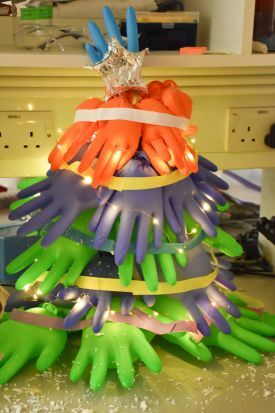 Meanwhile, the Beeson group wowed the judges by taking the glove tree and going one step further, creating a beautiful petri dish tree adorned with fairy lights. The idea sprouted from all the agar plates they were trashing after unsuccessful molecular cloning experiments. Here the green colours came from mixing yellow LB medium with blue protein dye – who said science can’t be artistic? 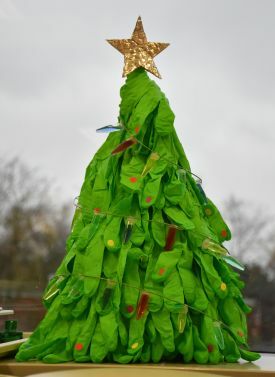 Other memorable decorations included the Buckle group’s tree - their Christmas baubles were conical flasks filled with coloured liquid. 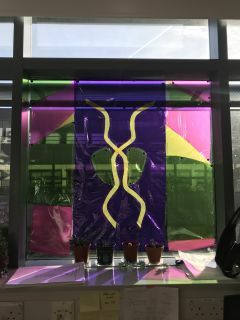 The colours were made with chemical dyes, protein reagents and cell culture media all used in their lab. 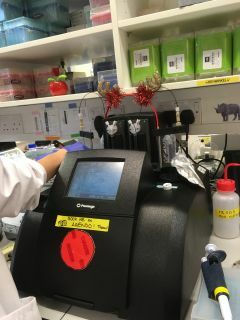 Eppendorf tubes were a common design tool, but the Buckle lab put little fairy lights in theirs to give their tree an extra glow. Another scientific tree adaption came from the Nerlov lab, who research hematopoietic stem cells - the tiers of their tree represented different stages in stem cell development. 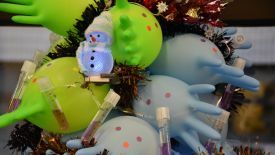 It’s safe to say the Christmas spirit has spread through the MRC WIMM like a virus. 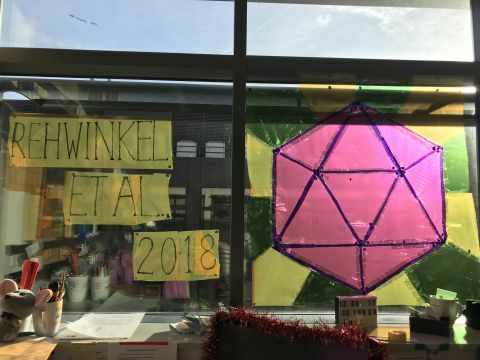 Big congratulations to everyone who took part and showed how beautiful and fun science can be! 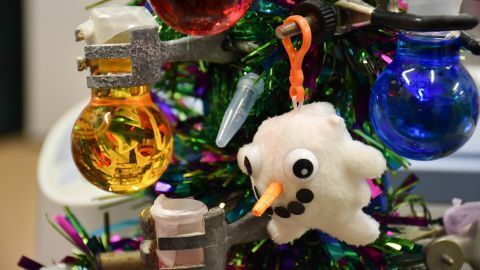 Post written by Abigail Pavey, Biochemistry undergraduate at Hertford College, who did a microinternship in science communication at the MRC WIMM in December 2018.